SwimOffice generates an IIF file on the 1st of each month you can import into QuickBooks. It contains all payments made last month (broken down by payment type), all non-recurring fees created last month, and all recurring fees generated this month (both added together and broken down by Chart of Accounts). The amounts are totals rather than all the individual transactions from customer accounts. You can look at the totals in SwimOffice that go into the IIF file, as well as the individual transactions of which the totals are comprised. We will look at December 2014, QB-Inv-CoA-2014-12.iif, as an example. Click Billing Admin > Invoices & Payments > Payment Sum tab. 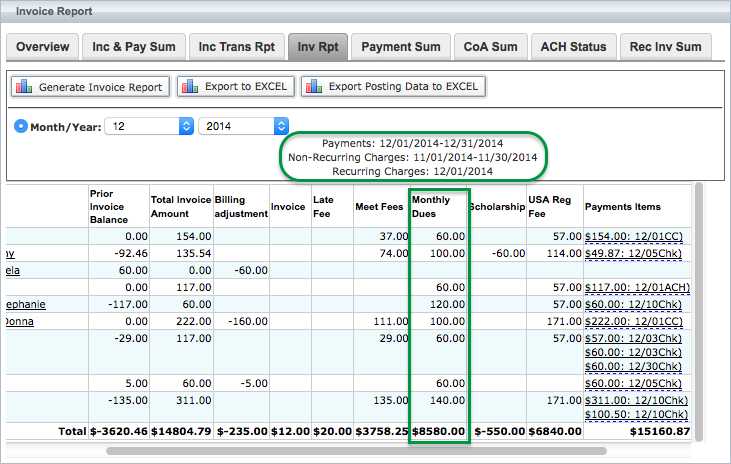 Set date range to the month prior to the IIF file (11/1/2014 - 11/30/2014 in our example). Click Generate Payment Summary Report. You will see all payments made by each Account. In our example, $7,452.50 in check payments for Nov. went into the IIF file. Click Billing Admin > Invoices & Payments > Inv Rpt tab. Set Month/Year to the month prior to the IIF file (11/2014 in our example). The “Payments Items” column lists all individual payments made by each account by date. Set Month/Year to the same month as the IIF file (12/2014 in our example). In our example you can see the total for the Monthly Dues CoA was $8,580.00. Those are the two reports to use when determining what goes into an IIF file. Other reports, such as Inc Trans Rpt, will not work for this purpose due to including recurring and non-recurring fees in the same month. You can also view the contents of the IIF file if you want to compare it with what you see in SwimOffice. Do financial transactions from Lessons get included in the QuickBooks iif file?